Truls Mørk, this season Artist in Residence with the Orchestre Philharmonique de Radio France, is the soloist in the two contrasted cello concertos. His "seemingly flawless technical command" is tested in the suave, expressive, famous No.1 as well as in the many taxing solo passages, huge leaps and double-stopping flourishes of No.2. The indefatigable duo Louis Lortie and Hélène Mercier join in the posthumously published Carnival of the Animals, after a highly successful recording of Concertos by Poulenc with Edward Gardner, Disc of the Week in The Sunday Times. They offer the original version, which features a glass harmonica (normally substituted by a glockenspiel). Louis Lortie is also the soloist in the entertaining fantasia Africa, which incorporates folk tunes of the different countries in which it was composed and which is brought off with consummate zest, as well as in the most characteristic and probably challenging of the composer’s keyboard pieces, the Caprice-Valse Wedding-cake, written for the second wedding of the composer’s virtuosic pianist friend Caroline Montigny-Rémaury. The Chandos label gets 2016 off to a cracking start with this new disc of popular works by Saint-Saëns. The main attraction is Truls Mørk's accounts of the two cello concertos, contrasted but complementary works separated by three decades (1872 and 1902). Mørk is a player capable of making a big sound, but here he finds just the right tone for pieces that bring Gallic charm to a Germanic genre. With the cello given a natural, unexaggerated balance against the orchestra, these performances have a delightfully airy feel to them: try the minuet-like middle movement of the First Concerto, which has seldom sounded so fetchingly graceful. Yet the outer movements have Mendelssohnian drama aplenty about them, opening out for moments of sublime tenderness. In the marvellous Second Concerto, Mørk makes light work of the formidable technical demands in a reading that combines bravura with rapt poetry in ideal measure. Neeme Järvi and the Bergen Philharmonic are the perfect partners, with lustrous strings and the woodwind playing particularly fine. Truls Mørk may have the lion's share (excuse the pun!) 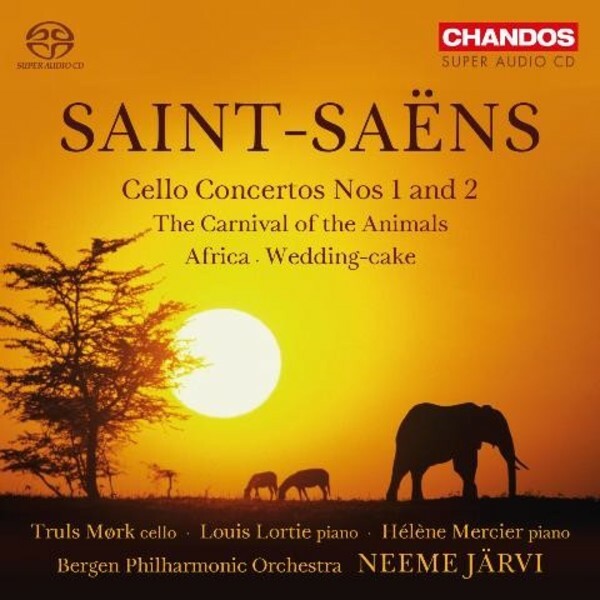 of the playing time on this disc, but he shares the honours in a splendidly idiomatic account of Saint-Saëns's 'Grande Fantaisie zoologique', The Carnival of the Animals. Unpublished during the composer's lifetime, this is a work whose humour can misfire in the wrong hands – happily not the case here! Thanks in large part to the deft playing of pianists Louis Lortie and Hélène Mercier, this is one of the most enjoyable accounts in recent years. The absence of a narration is a veritable plus when the music-making is this spontaneous. It's a shame that the double bass soloist in the 'Elephant' movement goes uncredited in the booklet, but a huge bonus to have the magically watery sound of a real glass harmonica in the Aquarium, with Alasdair Malloy doing the honours. Just as rare is for the 'Pianists' movement to sound genuinely unrehearsed, as asked for by Saint-Saëns, but Lortie and Mercier here succeed in bringing off the impossible, neither hamming things up nor ironing out the joke. Mørk introduces a meltingly serious note in 'The Swan', before the closing high jinks. It's all tremendous fun, brilliantly brought off by all concerned. Louis Lortie then takes centre-stage for the icing on the cake: the Wedding-cake Caprice-Valse (a truly sparkling performance with warm orchestral support), followed by another showpiece, the fantasy for piano and orchestra Africa. This journey across north Africa is immensely spirited, with dazzling fingerwork from Lortie, and the Bergen players obviously enjoying themselves. It's the perfect conclusion to a thoroughly entertaining disc. The Hybrid SACD recording (made in Bergen's Grieg Hall, with support from the Grieg Foundation) is as first-rate as one has come to expect from Chandos, with a well-judged degree of spaciousness to the acoustic. The presentation is attractive and Roger Nichols's notes are as informative as ever. A fabulously entertaining disc!